The problems continue. Tattoo regulation has taken many different forms depending on which country, province or county that it exists in. While I continue to be a supporter of tattoo regulation and proper licensing, there’s no escaping the fact that no amount of regulation is ever going to completely wipe out DIY tattoo and the purchasing of cheap tattoo equipment off the internet. 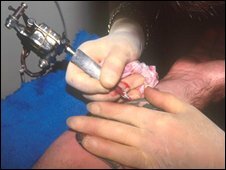 In the UK and particularly in Scotland, tattoo parties in which underage people gather at someone’s home and proceed to get tattooed by unlicensed and untrained scratchers, is on the rise. This is an issue that needs to be dealt with, not by the tattoo community (as has been the case thus far, with licensed tattooists having to clean up the shoddy work of scratchers on young people), but by the governing bodies and health departments of those governments. Licensing professional tattooists and doing annual inspections of their studios has nothing to do with the ability to purchase tattoo equipment off the internet and throw a tattoo party. In Edinburgh, Scotland this week, three scratchers have been charged with performing illegal tattoo on underage clients. It’s good to see that authorities are clamping down on this type of activity, but I don’t particularly care for the ignorance on the part of governing officials as they seem to be subtly pushing the ball back into the court of licensed tattooists. ‘There are 27 licensed premises in Edinburgh which carry out a mixture of tattooing and/or body piercing, with around 60 licensed individuals working in these studios. It’s clear that the numbers don’t support the idea that the cause of this problem rests with crooked tattoo operators. The real issues here need to be focussed on. Legislation and regulation are important aspects of any tattoo industry, but beyond this, the real rule of law needs to find a way to eliminate the ease with which untrained, unlicensed scratchers can easily get their hands on tattoo equipment. Until this occurs, we will only see tattoo parties and illegal tattoo rise.